Janice Park, DMA, is an instructor of music and Coordinator of Secondary Piano at the Hall-Musco Conservatory of Music at Chapman University. She is also 1st Vice President and Program Chair of the Music Teachers’ Association of California Orange County Branch. She received both her MM and DMA from USC and a BA from Chapman University. She taught music theory and was the pianist for Women’s Choir at Chapman. She has also been a faculty member at the Irvine Valley College, the Pasadena Conservatory of Music and an Assistant Lecturer at USC. Dr. Park has been active in solo, ensemble and collaborative recitals, including: performances with the concert master of the Pacific Symphony, as a soloist with Chapman Orchestra, Piano Trio recital at USC and chamber recital at the Colburn School in Los Angeles. She was invited twice by Detroit Chamber Winds & Strings to perform both chamber and solo music. In the past year she was the featured pianist for two separate world premiere concerts, one locally and one in South America. 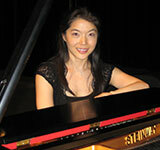 She is frequently sought to act as a clinician and as an adjudicator for competitions and piano festivals. She is a member of Music Teachers National Association (MTNA), Music Teachers’ Association of California (MTAC), and Pi Kappa Lambda National Music Honor Society. She has served as a member of the Board of Directors of the Musical Arts Club of Orange County. Her article on how to teach piano students was published in the piano magazine, Keyboard Companion.